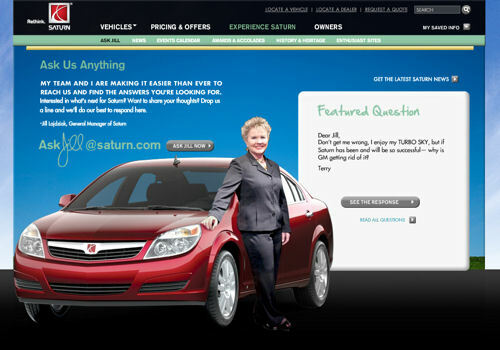 Saturn recently added a new feature to its website that allows visitors to pose questions directly to General Manager Jill Ladjziak. Some folks have already taken advantage of the opportunity. They've asked questions about Saturn's future, the impact any changes in ownership will have on their vehicle warranty, and who she rooted for during the Stanley Cup finals (well, maybe not that question). Keeping in close contact with customers is something Jill has always felt strongly about and excelled at doing. This new tool gives Jill and her team a way to communicate on a personalized level with owners and enthusiasts. If you have any questions for Jill, head on over to Saturn.com. 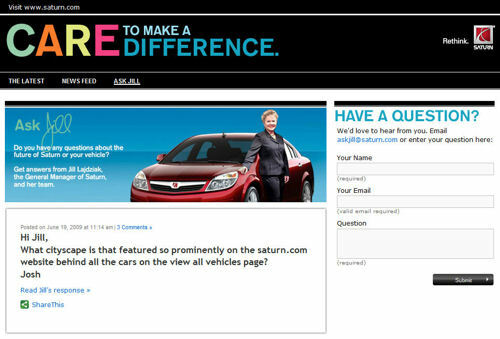 But the "Ask Jill" section is just one of many initiatives Saturn has implemented to expand its footprint on the Internet. The Saturn team has been busy. The brand's primary consumer website, Saturn.com, was overhauled a few months ago. It features a more intensive graphical and interactive interface. 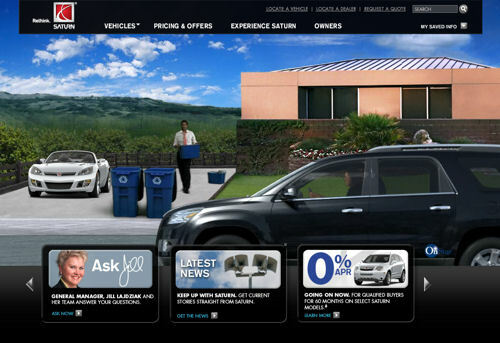 The main screen is reminiscent of the popular "Sims" video game series, providing a fun way to "explore the neighborhood" and learn about Saturn, its vehicles, and values. A couple of years ago, Saturn launched a quarterly owner magazine called "Saturn Signatures." 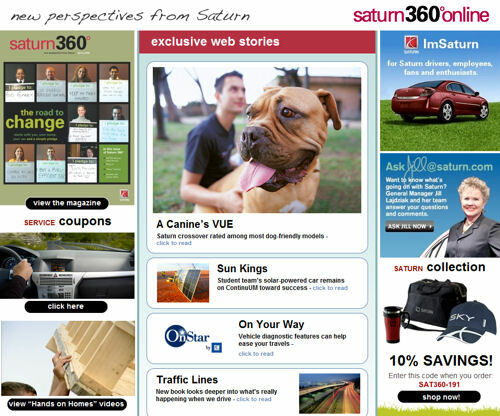 Last year, the periodical was refreshed and relaunched under the name "Saturn 360." This spring, Saturn began publishing an online version of the magazine at saturn360online.com. On the website you can virtually page through the latest edition, view exclusive web stories, and print out coupons for discounts on vehicle service and accessories. In an effort to keep owners and enthusiasts up-to-date on the latest news and rumors concerning the company's future, the brand created SaturnCares.com. The website aims to keep folks informed, while simultaneously letting visitors "connect, share, and help shape" Saturn's future. You can ask Jill questions directly from there as well. This multi-pronged approach indicates just how hard Saturn wants to show the public that it is full of life and planning to be around for many years to come. Its good to see Saturn taking a proactive approach to spreading the word about it future, and demonstrates that despite changing ownership, the brand is still determined to put people first.